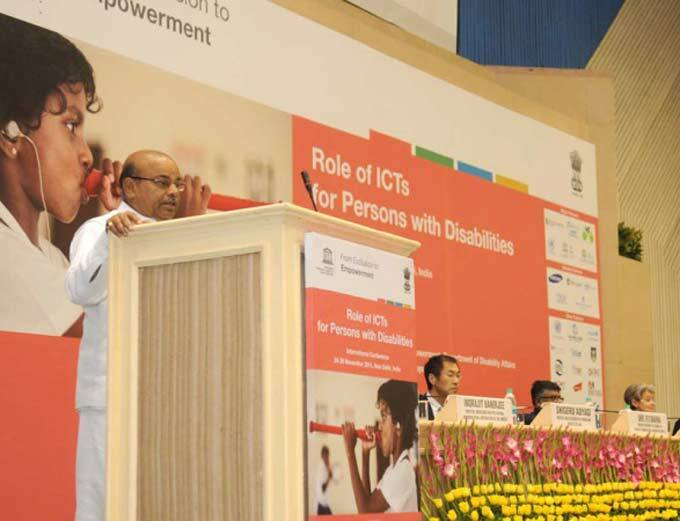 ICT can help Government to empower persons with disabilities (PWDs) and lead to their inclusion, said Minister for Social Justice & Environment Mr. Thaawar Chand Gehlot. 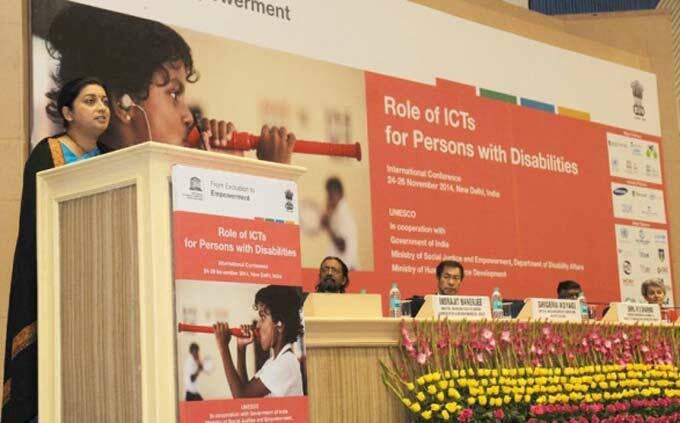 The UNESCO’s International Conference “From Exclusion to Empowerment: Role of ICTs for Persons with Disabilities” was held in New Delhi on November 24. The inaugural session was addressed by Mr. Ravi Shankar Prasad, Minister of Communications and Information Technology, Mr. Thaawar Chand Gehlot, Minister for Social Justice & Empowerment, Ms. Smriti Zubin Irani, Minister of Human Resource Development and Ms. Irina Bokova, Director-General of UNESCO. “My Government is focusing on a seven point agenda relating to the disability sector. These include enactment of the Rights of Persons with Disabilities Bill to fulfill our international obligation post ratification of the UNCRPD; using technology to deliver low-cost, home-based education through e-learning; issue of Universal ID to each and every person with disability for availing government benefits; developing income generations models to ensure economic independence; ensuring access to public facilities, public buildings and transport; aid and support to voluntary organizations; and tax relief to the family members taking care of persons with disabilities. “As you all are aware, India was among the first countries to ratify the UNCRPD. The National Policy for Persons with Disabilities of 2006 recognizes that Persons with Disabilities are a valuable resource for the country, and seeks to create an environment that provides them every opportunity to participate fully in society”. “According to the Census of India 2011, there are 2.68 crore Persons with Disabilities in the country, which constitutes 2.2% of our population. In order to create an inclusive society, the Government, development partners, civil society and disability sector experts are working together to ensure protection of the rights of Persons with Disabilities through a range of early intervention services, protection of rights, provision of aids and assistive devices and promoting accessibility in public buildings. Inclusion means providing equal opportunities in education, skill development, economic empowerment and ensuring full participation of Persons with Disabilities in family, cultural and social life; in administrative and political spheres. It is our collective duty to ensure that Persons with Disabilities are empowered to lead a safe and dignified life as citizens of India”. “To achieve this end, a standalone Department of Disability Affairs was created in May, 2012 which has initiated since then many new initiatives. The Artificial Limbs Manufacturing Corporation of India, (ALIMCO) our state owned enterprise, manufactures wide range of cost-effective ISI marked assistive devices on a mass scale for disabled people. Since its inception in 1974, it has enabled 4.2 million people. The Department of Disability Affairs is administering 3 legislations namely Persons with Disabilities Act, 1995, National Trust Act, 1999 and Rehabilitation Council of India Act, 1992. It is supported by 7 National Institutes, 3 statutory bodies namely Rehabilitation Council of India, National Trust and Office of Chief Commissioner for Persons with Disabilities and 2 Central Public Sector Undertakings namely ALIMCO and NHFDC. The Department is in the process of establishing the National Institute of Inclusive and Universal Design, Indian Sign Language Research and Training Centre, National Institute of Mental Health Rehabilitation, Centre for Disability Sports and Centre for Disability Research”. “Day by day, new trends in science and technology have enabled ICT applications to meet the various needs of persons with disabilities. The Prime Minister of India has announced a nationwide campaign for a "Digital India" which would bring ICTs to the doorstep of every Indian citizen. The Prime Minister has emphasized the critical role ICTs play in good governance and in enhancing inclusive growth and development. This is an important opportunity to work towards integrating ICTs with a wide range of other offline systems and services”. 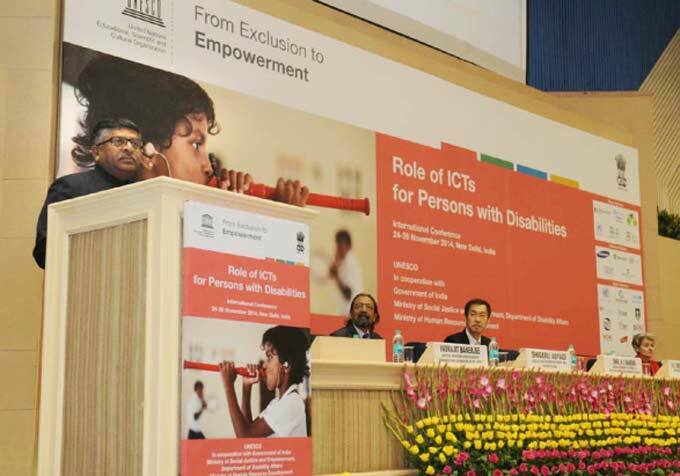 “This high-level International Conference on the role of ICTs for persons with disabilities should contribute to meeting our vision of inclusion of Persons with Disabilities in India and worldwide and should benefit from a range of ICT-based applications. I hope that this Conference will give a new impetus to the partnerships and technological innovation efforts to improve the status of persons with disabilities and also combating poverty in developing countries. We trust this Conference will provide a road-map for a more inclusive society, which prevents discrimination and encourages participation of Persons with Disabilities in all spheres of life. I also hope that this conference also explores how best ICT could be used for the economic empowerment of PwDs”. Present on the occasion were MoS for Social Justice Vijay sampla, Secretary, Department of Disability Ms. Stuti Kakkar, Official of the Ministry and Delegates from UNESCO.